Note: Untrapped broke his maiden in his second start last year at Churchill Downs in November. 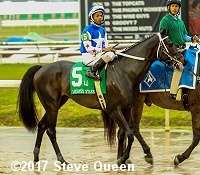 He made his 2017 in the LeComte Stakes (G3) at the Fair Grounds, finishing second. He followed that up with another second place finish in the Risen Star Stakes (G2), then to Oaklawn where he finished third in the Rebel Stakes (G2) then 6th in the Arkansas Derby. Sent off as the 58-1 longest shot in the Kentucky Derby (G1) he finished 12th beaten 19 1/4 lengths.